Light: Expressing yourself with firmness and authority. Rendering a final decision. Consulting an expert. Calling in advisors and consultants. Coming to a final conclusion. Reaching a beneficial agreement based on sound information. Shadow: Insisting on having the last word. Flaunting your intellectual capability. Talking “over the heads” of others. Waffling on an important decision. Constantly changing your mind. Refusing to make choices that are in your own best interest. Wishing in vain you could take back what’s been said. 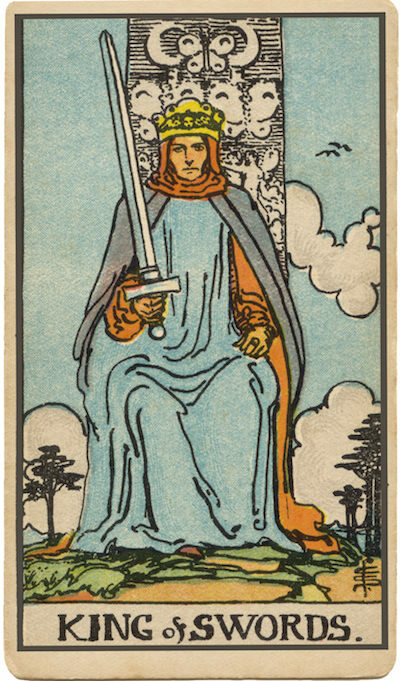 Personality: The King of Swords can represent anyone who tends to control or seek to control (King) intellectual and verbal responses (Swords). The King may also represent the tendency to be more blunt than diplomatic, or the need to bring something to a conclusion once and for all. Story: The Main Character must choose a side and stick with that choice, regardless of the consequences. Relationships. Say what you mean, and mean what you say. Your friends and partners need straightforward feedback; give it to them. Avoid trying to control what someone says or how he or she says it. When an argument’s over, let it be over. Do what you said you would do. Work. Don’t waffle. Make commitments and stick to them. If you say you’ll meet a deadline, do so. If called on to evaluate the work of others, don’t sugar-coat the results; render a fair verdict. Strive to be known for your honesty; avoid brown-nosing and voicing empty praise. Spirituality. Listen for the still, small voice, and, when you’ve heard it, act on its advice with total confidence. Don’t hesitate to confirm your verdict with a wise counselor whose opinions you respect. Be sure to let your spirituality temper your conversation, and match your words with deeds. Personal Growth. Strive to be consistent. Let your word be your bond. One measure of maturity is the ratio of words spoken vs. words listened to. Grow (and gain respect) by learning to hear what others are saying. Reserve judgment until after all the evidence has been heard. Fortune Telling. This card represents an older man with an insightful, deliberate spirit, likely born between May 11th and June 10th, who is known for his integrity and sharp decision-making ability. When? Between May 11th and June 10th. The Airy Throne. To emphasize the airiness of this suit, the throne of the King of Swords may be decorated with flying creatures … or, in some decks, may hover in space. Air’s qualities include logic and communication. How might these qualities be deployed to improve your situation? Solomon Enthroned. The gravity and wisdom of this King are unmistakable—he is an incarnation of Solomon, who ruthlessly applied logic in order to render wise decisions. In your own situation, should you rely more on logic or wisdom? What might happen if you blended the two? Thoughtful Bravery. How comfortable are you with the fact that not everyone may support or applaud your decisions? How willing are you to make decisions that alienate some people? The Marseilles Image. The Marseilles King of Swords is composed and alert, maintaining a posture of readiness. He can be seen as a reminder that paying attention is half of solving any problem. Watch the actions of those around you. Weigh their statements carefully. Review records. With a holistic picture in hand, you’ll make a better decision. What would your decision be if you had to render a binding verdict right now? How comfortable are you saying exactly what you mean? How often do you temper what you have to say for fear of offending others? If you were to ask others, “What’s my area of expertise?” what would they say?